I am a big fan of stationary. My whole time at drama school was spent in and out of Paperchase. I’d get excited going in and checking out the latest designs. The smell of the paper in a new notebook, the flow of a new biro on crisp white paper… Oh god, I’ve just heard myself – less Stationary Lover, more Stationary Addict!! I had different notebooks for each subject, a cute little pencil case and a different colour pen for title and main body of text – I’m no different now I might add! My diary is full of different coloured pens. I’ve decided, surely I’m not the only stationary addict/lover out there and others might like to see my little collection. So, I have created this little post as a dedication to some of my beautiful stationary (yes, I can hear myself!) and maybe you’d like to purchase some of my little bits, they may help you stay organised and pro-active. NB: This is just a couple of items as this post would have been extremely long!! Pens!! Okay, it’s pretty sad to get excited about pens but I absolutely love these Bic Multicolour Ballpoints. The blue one I have had for ages. In fact I love it so much I bought a pack of 3. It’s a 4 colour pen – red, blue, black and green and they just write so nicely. You can buy them pretty much anywhere but Rymans do a standard pack of 2 +1 free for £5.49. 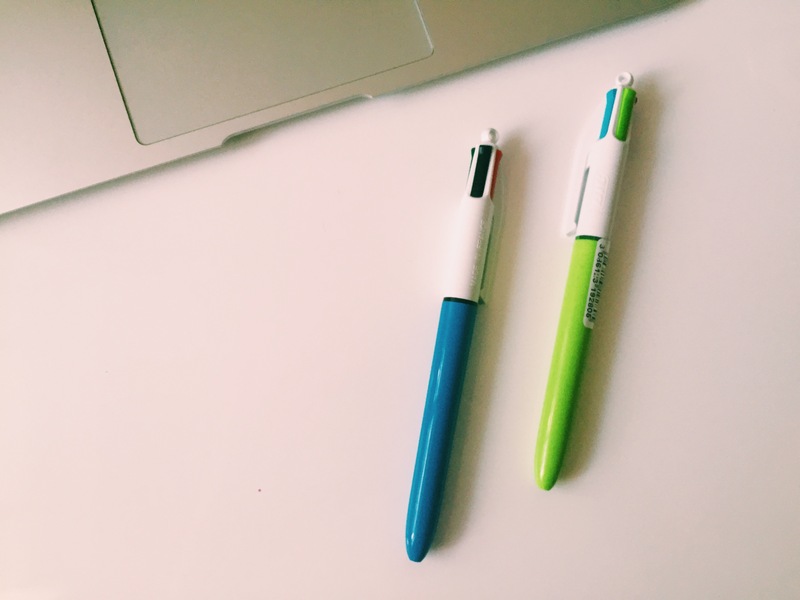 My Bic Multicolour Ballpoint addiction didn’t end there as I ended up buying another one with some prettier colours – pink, light blue, light green and purple. They also have the same offer in Rymans of buy a standard pack of 2 + 1 free. My diary is my life saver. I have so much going on – auditions, parties, 3 different jobs and a social life (just about!) so it’s important for me to keep up to date with where I am each week. Before the one below I had a Filofax which I loved but I decided I wanted something smaller and simpler so I bought, what probably looks like an extremely boring, 2015-2016 Academic Diary. It’s a week on two pages, which I really like as I can see the week as a whole. I also like to fill my diary in with different coloured pens (of course with my Bic Multicolour!!) just because it makes it look colourful and each appointment stands out instead of all being in black or blue. You can buy one of these diaries anywhere. Mine was £3.00 from Sainsburys (but with my nectar points I only ended paying 50p – oh yes bargain hunter over here). The weekly desk pad. A cheeky new purchase to jot down when posts are going to go live, when they need to be finished by and what I need to do that week to get it complete. Again I can crack out my cheeky multicoloured pens to jazz it up and keep me organised. It’s great as a to do list as you can write down what needs to be done on certain days. It certainly keeps me up to date with all my posts. This ones from my favourite stationary shop Paperchase for £7. And last, but not least, this beauty. My new purchase, the Macbook Air. It’s thin to carry around – as we speak it is off to the boat with me to get some blog posts done. (And yes, we are heading back to the boat for the bank holiday weekend, what rascals!) Since getting back into blogging I have found this a great little laptop to tip tap away on. Before it I had the Macbook pre 2008 (in white) and it was huge. This is the 11″ which is just a cute little size for me compared to the 13″ and you can check out all the tech speck on the Apple website. It has a great battery life of up to 12 hours. I think you are either an Apple lover or not and I certainly love all Apple products. What with my iPhone, Macbook Air, iPad and numerous iPods over the years, you could definitely call me an Apple Fan! So, that’s just a few little items I know I can’t live without. With this post, I’ve either bored you or sent you in to a stationary frenzy! Who knows?